Clontarf is owned by Castle Brands Inc, who are based in New York. The actual distillery from where the whiskey is produced is located in Dublin. They also produce the Knappogue Castle range of Whiskey. At the battle of Clontarf in 1014 Irish high king Brian Boru sent Viking invaders back into the sea and achieved a remarkable victory for the Irish over the fearsome Vikings. The two armies met on the fields of Clontarf near the city of Dublin on Good Friday in the spring of 1014. The battle lasted all day raging across the fields and forests with no side gaining a clear advantage. Finally, with all of their leaders dead or dying, the Vikings broke ranks and returned to their ships. Out of 8,000 men who fought that day, almost 6,000 were killed. The destruction of the Viking forces, including the deaths of virtually all of the Viking kings, permanently ended the Invaders’ presence. Through this valiant and bloody victory at Clontarf, Brian Boru and his men made possible the Ireland that we know today. 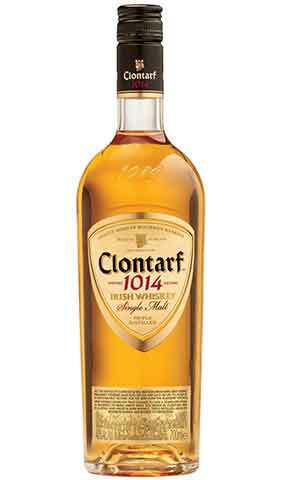 So the Clontarf whiskey stands for bravery and permanence with its whiskies well ingrained into the Irish folk lore. Using malted barley and pure Irish spring water, Clontarf Single Malt is triple distilled and aged to smooth perfection in bourbon barrels. Its nose is full of character with a sharp, grassy maltiness to it. The taste is richly textured and it finishes with varying shades of malt ending with a late oaky complexity. Believed to be distilled at the Bushmills distillery. 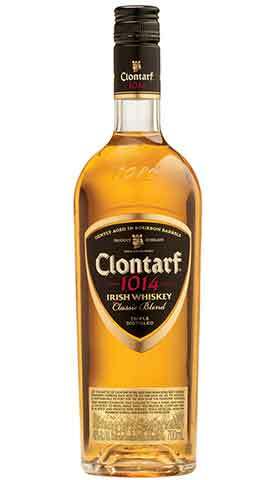 Clontarf Irish Single Malt Whiskey, is named after an ancient village nestled along Dublin Bay's northern shore. It was here in the year 1014 that High King Brian Boru defeated a mighty Viking army, the famous Battle of Clontarf. Today, Clontarf is a suburb of the bustling capital of Dublin. Using malted barley and pure Irish spring water, Clontarf Single Malt is triple distilled and aged to smooth perfection in bourbon barrels. This Clontarf whisky blend has been distilled three times and then matured in ex-Bourbon barrels. "A light, vanilla-rich, soft Irish whiskey"